Not sure if you remember but a couple of months back I won a Joy of Sets Blog challenge by creating a letter C themed card. In case you don't know the JoS Blog Challenges are based on letters of the alphabet at the moment so it's a pretty broad remit. When you win you are invited to guest design with the design team and I was chosen to guest design for the month of September, now, when the theme letter is J. There has to be some connection to the stamp set and the theme of the challenge so I just about scraped in this month using a stamp with a word beginning with J from one of the brand new as yet unleashed on the public stamp sets from the A/W 2017 Stampin' Up! catalogue. I created this Just Married card. I didn't go overboard on my theme as I have in the past (see C and B entries). I kept it very simple, stylish and classy but add a touch of whimsical with the stamp set. I loved making this card and threw out a little bit more creative energy than usual in designing it. All of the materials I used are linked below, click and you'll be able to buy them if you wish or use this for inspiration to make a card for any occasion. I was inspired by a couple of cards I received recently and this card shows how blending together inspiration from other crafters can result in something fabulous. If you check back to my Birthday Card Tribute and my Love a Good RAK posts you'll see which cards inspired the colour theme and the cut of this card. As ever as a novice card maker I am eternally grateful for the inspiration of my gifted friends in the craft community. So I started off with a Very Vanilla Thick Cardstock base and then layered on Bundle of Love gold foiled DSP and Fresh Florals in Powder Pink. I used Very Vanilla cardstock to stamp and gold heat emboss various images and sentiments from the Wonderful Life stamp set (Brand New Go Grab it, it's super fab - so new that it wasn't available to link when I wrote this post but I'll add it when it is) and the Better Together Stamp Set. I printed out a monogram of the happy couple's initials and also the date of the wedding in a really light gray on Very Vanilla and then went over them with a Powder Pink marker. I added some ribbon edge detail using the ribbon edge punch and constructed it all using dimensionals and TomBow liquid glue for the mats and layers. Hope you love this card just as much as I loved making it. It's been my absolute pleasure! There is nothing better than a challenge to try out new things and to develop skills. 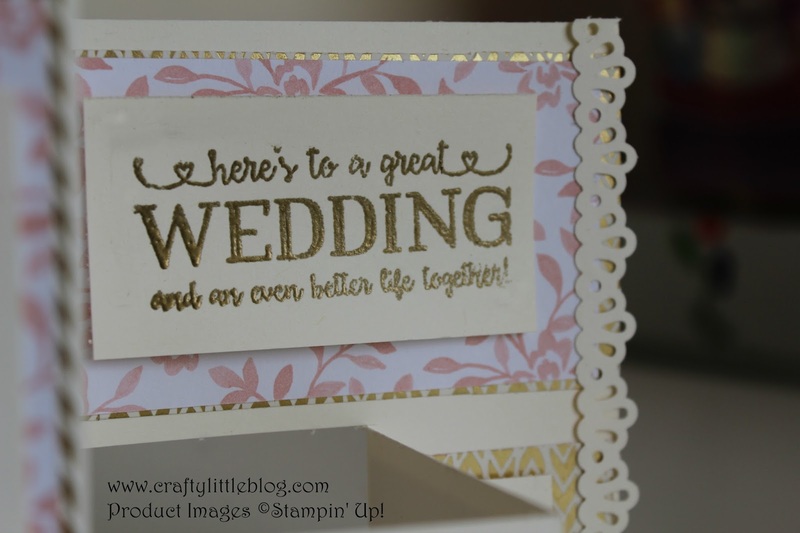 I would not have attempted this card a few weeks ago but the Stampin' Up! 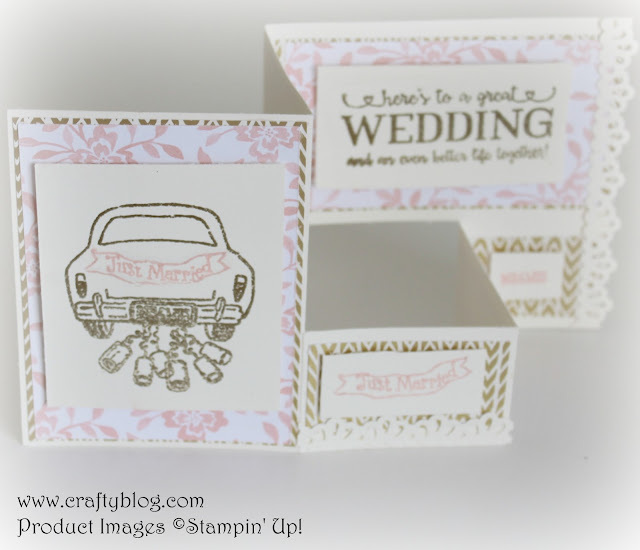 community and the Stampin' Up! products just make it all so much more tempting to just jump in and give it a go! Gorgeous wedding card Andrea, I love it. Fabulous card Andrea, congratulations on your win.